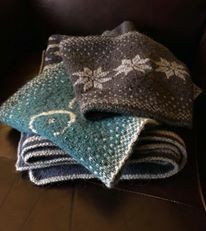 A Fairisle Cowl with a plain stocking stitch lining. The cowl is knitted entirely in the round and there is no sewing up – it is knitted in one piece. The Fairisle is beaded – fully explained. This is not steeked. 1st size: 28cm wide laid out flat and 25cm high; 2nd size: 34cm wide laid out flat and 25cm high. Approx. 250 beads, size 6.